You cross paths with him at the break of dawn in the corridors of the Metro. He looks bleary-eyed and pallid. This worker’s night shift just ended. His body clocks are out of sync with one another, and, imperceptibly, they’re also out of sync with his environment. In the long run, this night owl could be at greater risk of developing cardiovascular, autoimmune diseases or certain types of cancer. 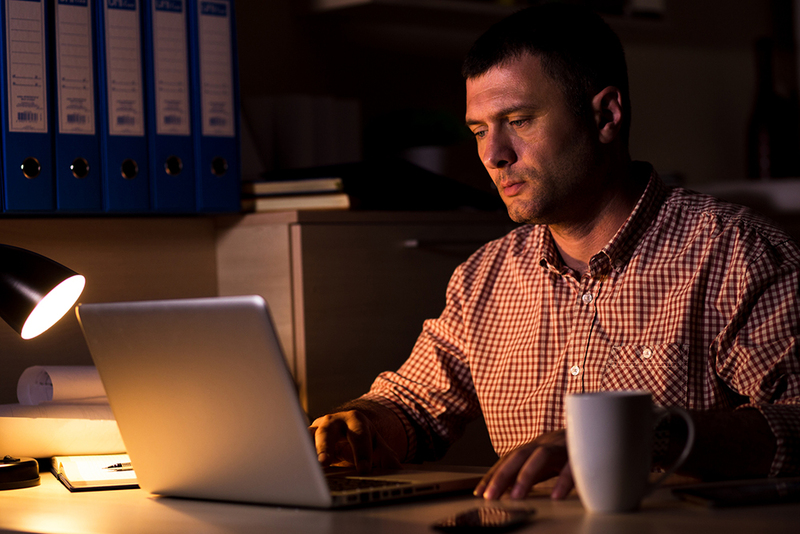 Do internal clock disturbances due to night work affect one’s immune system? The answer is yes, according to Marc Cuesta, Nicolas Cermakian and Diane B. Boivin, researchers at the Douglas Mental Health University Institute (CIUSSS de l’Ouest-de-l’Île-de-Montréal) and McGill University. Their study, published earlier this year in the Journal of Immunology, shows for the first time in humans the effect of a night work schedule on immune responses. “Studies in rodents and humans had previously shown that body clocks regulate immune response. It still wasn’t known if disturbing these internal clocks could have effects on the immune system in humans. This could indirectly cause health problems,” explains Dr. Nicolas Cermakian, a researcher and Full Professor at McGill University’s Department of Psychiatry. For this study, nine healthy volunteers were artificially subjected to a schedule simulating that of night workers. In a time isolation room they were deprived of any light or sound cues characteristic of the time of day. The researchers studied different aspects of the immune system. Among other things, they compared the rhythm of the secretion of cytokines, proteins synthesized by immune system cells, while the volunteers lived under a normal day-oriented schedule and then under a night-oriented schedule. “We found that the cytokine-secretion rhythms, which were normal under the day-oriented schedule, were disturbed when the volunteers were living under the night-oriented schedule,” says Dr. Cermakian. Such biological rhythm disturbances in humans, who are diurnal animals, are common. Previous research by Dr. Diane B. Boivin, research physician and Director of the Centre for Study and Treatment of Circadian Rhythms, showed that the circadian system of night shift workers can be adjusted to their atypical schedule. In a certain number of them, this adjustment sometimes occurs spontaneously. “Our study shows that circadian disturbances combined with sleep deprivation can affect our volunteers’ immune response when they live on a night-oriented schedule. We should now check if it is also the case for real night workers and what is the scale of the disturbances. Fortunately, this is an aspect where we can have an impact,” explains Dr. Boivin, a Full Professor at McGill University’s Department of Psychiatry. However, the exact impact of these rhythms on the occurrence of various health problems associated with night work has yet to be elucidated. Other important factors, such as sleep deprivation and lifestyle disturbances, should be considered. In industrialized countries, part of the population has abnormal light-exposure, food-intake or activity rhythms that can lead to a circadian rhythm disturbance and, according to the results of this study, an immune system disturbance. This research was funded by the Canadian Institutes of Health Research (CIHR), the Institut de Recherche Robert Sauvé en Santé et en Sécurité du Travail and the Fonds de recherche du Québec - Santé (FRQ-S). Marc Cuesta (PhD) worked as a postdoctoral fellow in the team of Dr. Cermakian and Dr. Boivin. He is currently a project manager at Brain Canada. Nicolas Cermakian (PhD) is the director of the Laboratory of Molecular Chronobiology at the Douglas Mental Health University Institute and a Full Professor at McGill University’s Department of Psychiatry. He studies the molecular mechanisms underlying circadian rhythms, especially in animal models. His work focuses on maximizing our understanding of «the gears in the biological clock» and their impacts on physiology. Diane B. Boivin (MD, PhD) is a research physician, founder/director of the Centre for Study and Treatment of Circadian Rhythms at the Douglas Mental Health University Institute and Full Professor at McGill University’s Department of Psychiatry. She is internationally recognized for her expertise in human circadian rhythms and their application in problems adapting to atypical work schedules and for the management of risks related to fatigue and jet lag. The Centre intégré universitaire de santé et de services sociaux (CIUSSS) de l’Ouest-de-l’Île-de-Montréal is made up of the CSSS de l’Ouest-de-l’Île, the CSSS de Dorval-Lachine-LaSalle, St. Mary’s Hospital, St. Anne’s Hospital, Douglas Mental Health University Institute, West Montreal Readaptation Centre, Grace Dart Extended Care Centre, and Batshaw Youth and Family Centres.